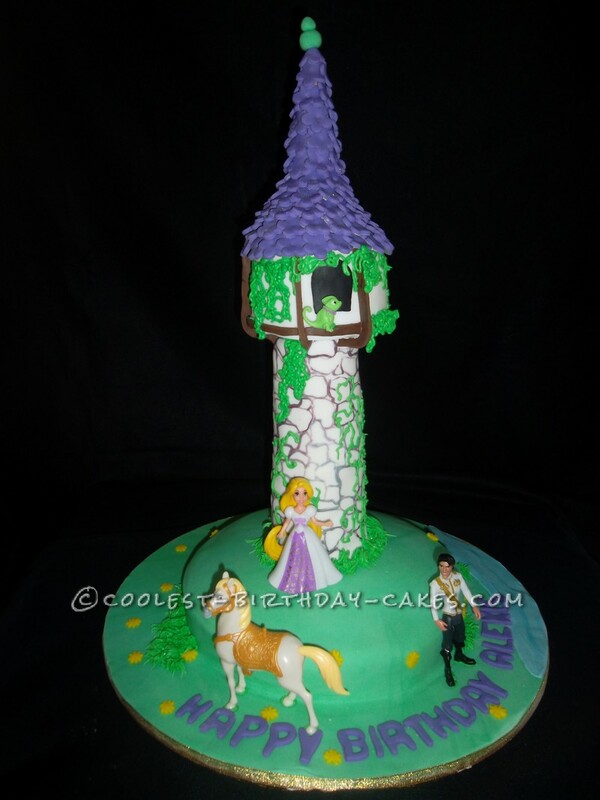 I made this Rapunzel Tower cake for my eldest daughter’s 6th birthday in December. She just loves the Disney movie Tangled, so we decided together on the Rapunzel Tower for her cake, although I did manage to keep her from seeing it until her actual party. The tower was white choc mud cake, which I cut from a larger cake I made using various circle cutters, then stacked them and stuck them together using white chocolate ganache. I did however put a rod down the center of it to support it, as I knew I’d have to transport it down to the local park for her party. The base of the cake is chocolate mud cake with chocolate ganache, and as with the rest of the cake, was decorated with RTR fondant. I pushed the rod through the tower and down into the base and also used some ganache to stick it. I wasn’t taking any chances! A couple more skewers went through the tower on different angles into the base to make certain it WAS NOT going to move. I used an ice-cream cone to top the tower, then cut the roof tiles out with a small cutter and stuck them all on individually. I did buy the plastic figurines of Rapunzel, Rider, Maximus and Pasqual to stick on the cake, partly because it was easier than trying to make them, but mostly because I knew my daughter would want to keep them to play with. On the morning of the party, I made sure to leave home super early and drive really carefully. With each corner I had to turn I had my kids shouting ‘Woo Hoo’ because the cake remained standing in it’s box on the front seat beside me!